The Herar was conceived as a low budget alternative for the Biogon. Including the prototype lenses the estimated total Herar lenses is 520, mainly employed as Contax RF mounted. This 1938 lens was another Zeiss prototype. 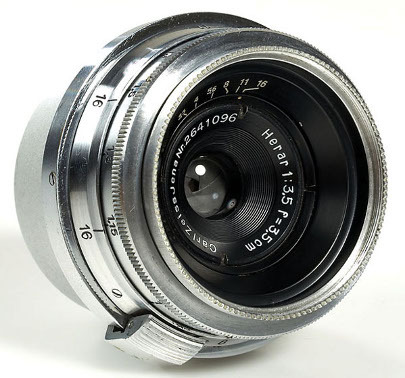 Besides some prototypes, only one batch of Herar lenses was produced in 1939, mainly in Contax RF mount. Intermixed in with the Contax lenses are lenses in Leica screw mounts. It is strange that some lenses were coated and some were not. This may have been part of the testing procedure, to determine the effect of coating on wide angle optics. Using five elements in two groups, this lens had only four air to glass surfaces. With such a low number of reflecting surfaces when compared to the eight such surfaces of the f2,8 3,5cm Biogon, the Herar should have had superior performance. It is therefore curious that it was not put into large scale production, as a lower cost alternative to the Biogon. It was of chrome on brass construction, was coupled to the rangefinder and fitted the outer bayonet mount. It had a 63 degrees field of view and a minimum aperture of f16. The aperture scale was inside the front rim and the apertures were set by turning that rim.